An accomplished stage director, Jim has worked in theatre for nearly 40 years. He has acted, produced, directed, designed and built sets and props as well as done special FX makeup. He has owned his own theatre company; “Stage Door Productions” and has also produced several short films. He lives in Northern Vermont with his wife, Jodi and their two kids, Ethan and Kaylee. Even their cat, “Shadow” is involved in production, playing ... Maggiori informazioni the character, “Isis”; Gary Seven’s black cat, for Anthology’s segment of Assignment: Earth. James has worked with Starship AJAX and Star Trek New Voyages Phase II as a makeup artist, set designer and prop maker. He’s very grateful and excited for this opportunity to produce a new show. Jodi Bray has been involved in theatre since The Music Man in high school and on and off for the past 30 years. This is Jodi’s first foray into the film arts, and she finds the differences in being in front of the camera and on stage to be at opposite ends of the spectrum. She’s excited about playing a StarShip Captain – an honor bestowed upon very few – and promises to keep her portrayal of RJ Cage’s character very true to canon of what a Starship Captain should be. Jodi’s biggest and most important role is that of Mom of a son and daughter. Love, laughter and light to those who wish to stand in the light. 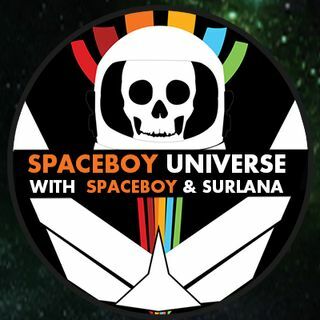 great stuff, Thanks Spaceboy and Surlana and have a great easter everyone!!! another good one in the bag! Wow!!!! Does it mushroom out? thanks so much Jim and Jodie, some really great people, a very interesting and entertaining presentation.. Thanks so much!!! I loved it Surlana & SB!!!!! LOL Gene!!!!! Colt .45 is a Dirty Harry gun right? Wow!!!! What kind of pistol do you have?